What steps should you take to safeguard your business? 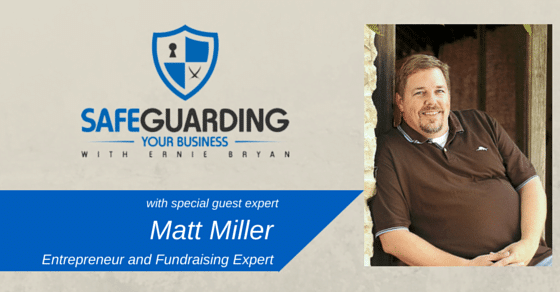 Join us as Entrepreneur and Fundraising Expert, Matt Miller, share numerous tips and insights on how to get out of the rat race and start working on your business and not in your business. The subject at hand is Matt Miller. Matt spent the first 9 years of his career as an Air Force pilot, before entering the corporate world to work at both Abbott Laboratories and Valassis. While a top performer for both companies, his long-term desire was to start a business and be his own boss. A good friend one day mentioned the gum ball machines he and his young daughters owned, and that conversation began a 10 year business quest that has brought Matt’s company, School Spirit Vending, to the cutting edge of both the vending and school fundraising industries. Today, School Spirit Vending’s Hassle-Free fundraising program is helping schools in 23 states raise money in it’s own unique way. Aside from fundraising, Matt developed a passion for reading at a very early age by reading comic books he bought at a local 5-and-dime store. With his unique positioning with schools across the country, he decided to start a comic book company, Sticker Swarm Media, in hopes of inspiring today’s kids to read like he was inspired 30+ years ago. Sticker Swarm’s 1st comic book series, Marlin & Percy, provides challenging reading and good clean fun for kids and adults alike. What is meant by companies created under “unbusiness” or “uncompany” philosophies. How Matt built his businesses so differently in some ways from the typical company and how this methodology can help you do the same. The concepts and benefits a passive business. Click here to subscribe, listen, and leave a rating/review via iTunes, RSS, or Stitcher. I value every review I receive, and if you take the time to leave one, THANK YOU!